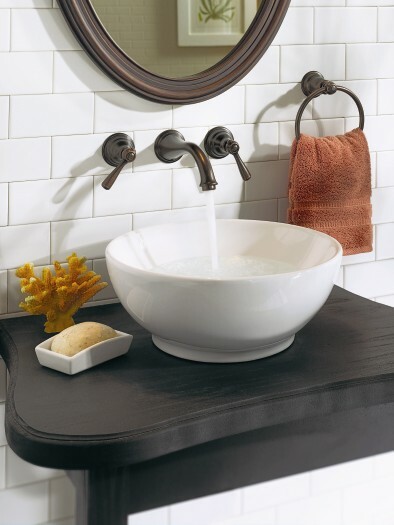 beautiful vessel sinks paired with wall mount faucets. Featuring a flared spout paired with a decorative lever, the Kingsley™ collection coordinates beautifully with any style of bathroom décor. Moen's Kingsley™ bathroom collection is a perfect solution for homeowners looking for the perfect way to incorporate their own distinctive style into their bathroom design. The stylish Kingsley wall-mount faucet epitomizes the ideal of subtle, timeless beauty in bathroom décor. “The popularity of vessel sinks continues to grow,” said Beth Allison, Moen’s wholesale group product manager. “Offering wall-mount faucets to complement these sinks provides style-savvy builders and consumers a new option to bring luxury and style to their homes.” Kingsley wall mount faucets are available in Chrome, LifeShine Brushed Nickel and Oil Rubbed Bronze. They are easy to install, durable, and are backed by Moen's limited lifetime warranty. Additionally, Moen's wall mount faucets are also designed to make it easy for homeowners to upgrade the style of the bath without replacing any faucet plumbing down the road. Faucets can be changed in just moments, thanks to a design that is equivalent to that of "plug and play" electronic devices. To changed out the faucet, all you'll have to do is unscrew the handles and spout, lift them out and replace them with the new style. For more information, see www.moen.com.